The meaning of grace in the life of a Christian. In every person there is a seed of good. However, just as a regular seed cannot grow and ripen without moisture and light, so does the soul of man remain barren until it is irrigated by the grace of God. Feeling the inadequacy of divine help within himself, King David prayed to God: “My soul thirsteth after Thee, as a thirsty land.” And all people who have a genuine thirst for righteousness realize that without the help of God, without His guidance and support, spiritual life is totally impossible. The grace of God renews a man’s soul, purifies his conscience, enlightens his mind, fortifies his faith, guides his will towards good, warms his heart with love for God and one’s neighbor, directs him towards heaven, inspires him with the desire to live by spiritual interests. It purifies and sanctifies man’s entire being. According to the testimony of the many who were favored with supreme spiritual illumination, the grace of God brings such peace and joy to a man’s soul that all earthly riches and all physical delights seem pitiful and insignificant in comparison. From the day the Holy Spirit descended upon the apostles, each newly-baptized person receives this grace of the Holy Spirit, just as did the apostles, in the sacrament of chrismation. The power of this sacrament is so great and indelible that, like baptism, it is never repeated. Subsequent sacraments of the Church, such as confession and communion, and also church services, home prayers, fasting, charitable deeds and a virtuous life serve to fortify and increase in a Christian the action of these gifts of grace that he had received in chrismation. The life-giving power of the grace of God reveals itself in beneficial internal and external changes in the people who have received it. These changes were especially evident in Christ’s disciples. Until the descent of the Holy Spirit they, as we know, were simple and illiterate people, and possessed no eloquence of language. When the Holy Spirit descended upon them, however, they became enriched with spiritual wisdom, and with their inspired words began to attract not only simple folk to the faith, but even philosophers and noblemen. Their grace-filled words penetrated the coarsest hearts, disposing sinners to repentance and correction, and the fainthearted to diligence. From timid and timorous people, such as the apostles were during the Savior’s life on earth, after the descent of the Holy Spirit they became courageous and dauntless. The result of the gifts of grace which they had received was the appearance of a multitude of Christian communities even while the apostles were still living, not only in various parts of the Roman Empire, but also beyond its boundaries: in northern Africa, India, Persia and the south of Scythia. Thus, due to the apostles’ indefatigable efforts, Christianity began to spread throughout the entire world, and together with it there began a renaissance of human society. One can become convinced of the life-giving power of the grace of the Holy Spirit by reading the book of “The Acts of the Apostles,” which describes the life of Christians during the first decade after the Pentecost. In fact, many sinful people, of little faith and exclusively worldly interests, upon receiving the Holy Spirit became deeply religious, righteous, full of zeal and fervent love for God and other people. “They (the newly-baptized), - as it is written in the book of Acts, - continued steadfastly in the apostles’ doctrine and fellowship, and in breaking of bread (communion) and in prayers. And all that believed were together, and had all things common, and sold their possessions and goods, and parted them to all men, as every man had need. And they, continuing daily with one accord in the temple, and breaking bread from house to house, did eat their meat with gladness and singleness of heart, praising God, and having favour with all the people…And the multitude of them that believed were of one heart and one soul. Neither said any of them that ought of the things which he possessed was his own, but they had all things in common…Neither was there any among them that lacked.” In other words, spiritual interests and a striving for the heavenly displaced all that was sinful and lowly in them. In his parable of the ten virgins the Lord talks about the necessity of acquiring spiritual gifts. Without them a person is like a lamp without oil or like a burnt and extinguished log of wood. In commenting upon Christ’s parable of the ten virgins, St. Seraphim teaches us that the goal of human life is the acquisition of the grace of God. It is customary to begin morning, evening and other prayers with an appeal to the Holy Spirit, with the words O Heavenly King. In this prayer we ask the Holy Spirit to renew us with His grace. The prayer “O Heavenly King” is remarkable in that it is expressed in the words of the Lord Jesus Christ Himself, and contains all that we should know about the Holy Spirit and what we should ask from Him. 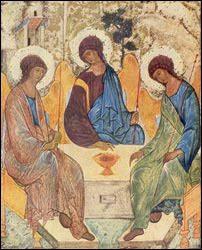 The Holy Spirit is called the “Heavenly King” as being the third Person of the Holy Trinity, equal to the Father and Son. He is called the “Comforter” by virtue of His quality of bringing comfort and joy to men. He is called the “Spirit of Truth” by virtue of revealing truth to men, and helping them see it and love it. He is called the “One Who is in all places and fills all things” by virtue of His Divine nature, which has neither limits, nor restraints. He is called the “Treasure of good things” by virtue of being a treasure-chest of all the good and precious things which can be desired by a man who is striving for perfection. He is called the “Giver of life” by virtue of giving life to all nature, and especially providing a grace-filled spiritual life to people and angels.